How do you get interventional cardiologists to look past the price tag for a product they don’t think they need? That was the challenge Osprey Medical faced when they introduced the DyeVert™ (now DyeVert™ Plus) Contrast Reduction System. Designed to reduce contrast dye used in angiography, it turned out that interventional cardiologists weren’t interested in dye reduction. At conferences they walked right by Osprey’s booth. Or if they did stop, the conversation was more about cost. The way to win hearts and minds of interventional cardiologists is through the kidneys. Osprey realized in order to get their audience’s attention, they needed to switch focus from the product itself to the purpose for it. Angiography patients with chronic kidney disease are at high risk for acute kidney injury from contrast dye. Reducing contrast with DyeVert™ Plus mitigates that risk. Their Be Kind to Kidneys campaign, introduced in 2016, focuses on the mission of protecting patients’ kidneys, rather than simply selling product. That message instantly caught on, and interest in DyeVert spiked. 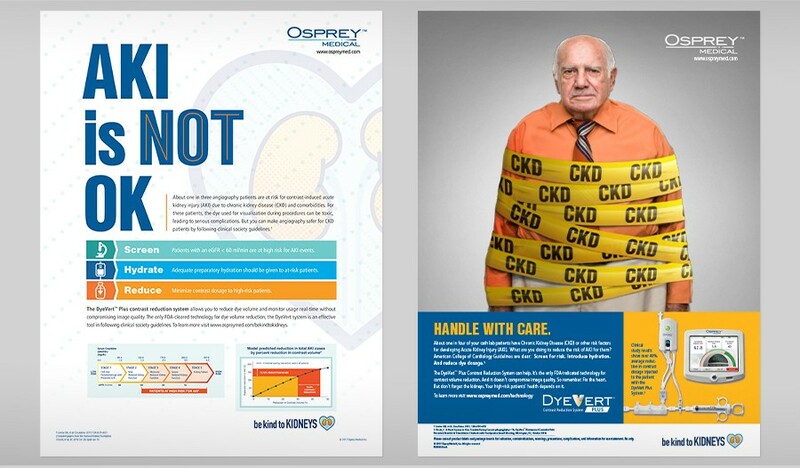 Osprey asked Introworks to build on the success of the Be Kind to Kidneys campaign with a new visual identity, enhanced messaging and a suite of tactics to keep momentum strong. 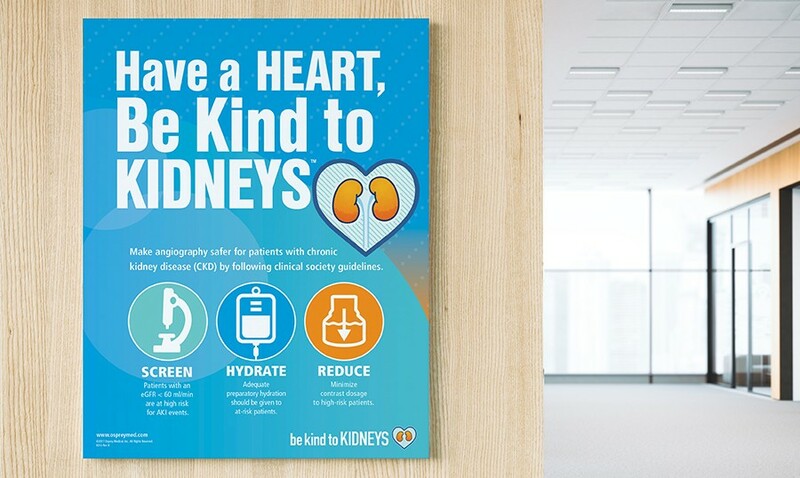 We created a Be Kind to Kidneys brand that had presence and personality of its own, but also worked as a sibling to the Osprey Medical brand, implementing the new brand in advertising, tradeshow graphics and collateral.